Even if we take Hemingway at his famously reductive words—doing our best to forget the dead snow leopards and clean well-lit places that haunt so many a term paper—those words weren’t the first on literary symbolism nor were they ever destined to be the last. A century earlier, Hawthorne was spinning his yarn about Young Goodman Brown, a woodland walk with the Devil, and his wife…ahem…Faith. Decades after Hemingway, Salman Rushdie was dropping angels from airplanes at the beginning of The Satanic Verses, Martin Amis styling his unholy apocalyptic trinity of Keith Talent, Guy Clinch, and Nicola Six in London Fields, Ian McEwan compressing the whole of modern European history in the last few paragraphs of Black Dogs. When it comes to literary symbolism, one size has never fit all. Handed a book with a title as thematically pregnant as Martha Brockenbrough’s The Game of Love and Death, you’d be a fool not to consider all the ways that title might be earned, to not at least entertain literary buzzwords like allegory and representationalism. A love story? Sure, yeah, that might work. A thriller? OK, there’s death in the title, so probably. But maybe there’s something beyond the visceral. Maybe, in spite of what Hemingway said, a sea isn’t always just a sea. Start reading Brockenbrough’s novel, her seventh, and you find all of the above: a romance wrapped in suspense, a dash of allegory thrown in for good measure. And it’s this combination that produces the sort of multi-layered satisfaction, and emotionally rich ending, you get from a book like The Game of Love and Death. The game in question is quite literal, an age-old contest between immortal personifications of Love (male) and Death (female). Each selects one human “player” at birth. Love then spends the players’ lives trying to bring them together romantically, trying to make them fall in…love. Death tries to nix one or both, to tear them apart forever. Though Death has won every one of their past matches, Love keeps playing, century after century, life after life, hoping this will be the time he finally wins. Mild, kind, and a little bit goofy, Brockenbrough’s Love is a little like a junior angel with a broken wing. Accustomed to loss, he’s fully cognizant of how much more powerful his opponent is, yet still somehow filled with hope for the players, himself, and even his nemesis, Death. In counterbalance, Death is a chain-smoking femme fatale who favors the reddest of lipstick and holds the blackest of desires. She wants your soul—again, literally. Actually, she wants yours, mine, and everyone else’s, to consume them utterly. More than any others, though, Death wants the souls of the game’s players, Henry (the ward of a newspaper baron) and Flora (a club singer and pilot who dreams of being Amelia Earhart). Though the book opens with the birth of the players and their selection by Love and Death, its present tense action takes place in Depression-Era Seattle with the real game, the end game, fast approaching. With Henry soon to head off to college and Flora dreaming of becoming the greatest of endurance pilots, Love and Death both show up in flesh: Love now disguised as James, “Mayor” of Seattle’s shanty town, Hooverville; Death taking the form of Helen, a lovely, young heiress and cousin to Henry’s foster family. Brockenbrough’s world in The Game of Love and Death is built on these sorts of dualities. Black and white, day and night, good and evil. Woman and man, rich and poor, gay and straight…love and death. The book’s action relies on the attempted synthesis of these various sets of opposites, moving towards a conclusion that will not only mean the end of the players’ love story (in one way or another), but may also cost them their lives. More than that, the game’s end may mean a fundamental reshaping of the relationship between Love and Death, a relationship that’s not quite as adversarial as it may have seemed. Humanity loves definitions, sees the world as fundamentally knowable, even the parts of it we can’t understand. We hope that in creating art, writing novels for example, we can somehow gain insight, even subconsciously, into the mysteries of life. This is part of the lure of symbolism, not only in literature but in other forms of art and, for that matter, religion as well. 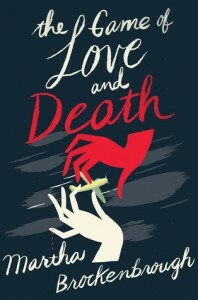 Aside from its dark humor, crisp pacing, and clean prose, The Game of Love and Death is a wide-ranging allegory about life and death, wealth and poverty, individualism and coupling; an allegory that helps produce an incredibly powerful ending, the words and emotions of which will be buzzing in your head long after you’ve set this book aside.